Consciously create habits, because habits unconsciously control your life. This time of year many people are attempting to change up their routines, hopefully transforming into an ideal version of themselves. Whether it’s diet and exercise or simply reading more, most will fail. Why is keeping a New Year’s resolution so difficult? Have you ever driven home from work, lost in thought, and not even remembered the drive itself? The entire sequence of driving a car requires a complex series of actions and choices that must be executed correctly and precisely, yet most of us can perform these actions without even thinking about them. The brain is constantly looking for ways to save effort, grouping sequences of actions into an automatic routine. This is very familiar to us when we consider athletic skills. Swinging a bat or a golf club is a very complicated and precise action, and when learning these actions, we have to learn each individual, minute motion. With practice, this complex sequence is eventually coded into a routine. When we wish to perform this sequence after we’ve mastered it, we no longer have to consider each individual action; our brains simply push the “swing the bat” button and we follow the routine. While that example sums up the creation of motor skills, how does that relate to forming a habit like daily flossing? Skillful marketers have long since mastered the art of creating habits. They understand that habits are formed in behavioral loops, where the desired (or undesired) behavior is linked to a specific trigger, even if they are unrelated. Charles Duhigg’s best-selling book, The Power of Habit gives several great examples of marketers putting this idea into action. Prior to World War I, few Americans brushed their teeth. Then Claude Hopkins (who is responsible for the success of Goodyear and Quaker Oats) arrived on scene to market Pepsodent, expanding toothpaste usage from 7% to 65% in only ten years. He then showed them pictures of beautiful people with shiny, white teeth and informed them that Pepsodent removes the ugly, yellow film. Despite the fact that what he said about ‘film’ wasn’t correct, nearly anyone who viewed that ad is going to run their tongue across their teeth, feel the film, and feel self conscious about it. After brushing with Pepsodent, their teeth felt clean and looked clean. Thus, a feedback loop, based on incorrect information, still left a positive result that triggered a habit of teeth cleaning all across the country. You need a cue. This is a trigger that tells your brain to execute a program. Have you ever accidentally driven to the wrong place while you let your mind wander? You need a routine. This is generally the behavior we are trying to turn into a habit, such as flossing, exercise, or reading. You need a reward. Positive reinforcement works. It’s easier to form a habit when the behavior make us feel good afterward. In order to change our habits, both removing undesired behaviors and consistently performing the desired ones, we have to pay close attention to our cues and rewards. The rewards might be easier to identify, but cues can often be easily overlooked because while they will correlate with the behavior, they might not be directly related. Let’s take a look at Duhigg’s formula to figure out the best way to form a new habit. 1.Identify the routine. This is the behavior you want to change. Perhaps you want to exercise more, floss regularly, or wish to stop your habit of eating junk food at work. 2.Experiment with rewards. The reward might seem easy, but if you want a habit to stick you need the reward to satisfy your urge to complete the routine. Do you find yourself heading to the vending machine every afternoon for a snack? Rather than getting a cookie, try other things like a healthy snack or going for a walk. Your afternoon cookie venture could be fueled by cues of hunger, boredom, a desire to chat, or fatigue. 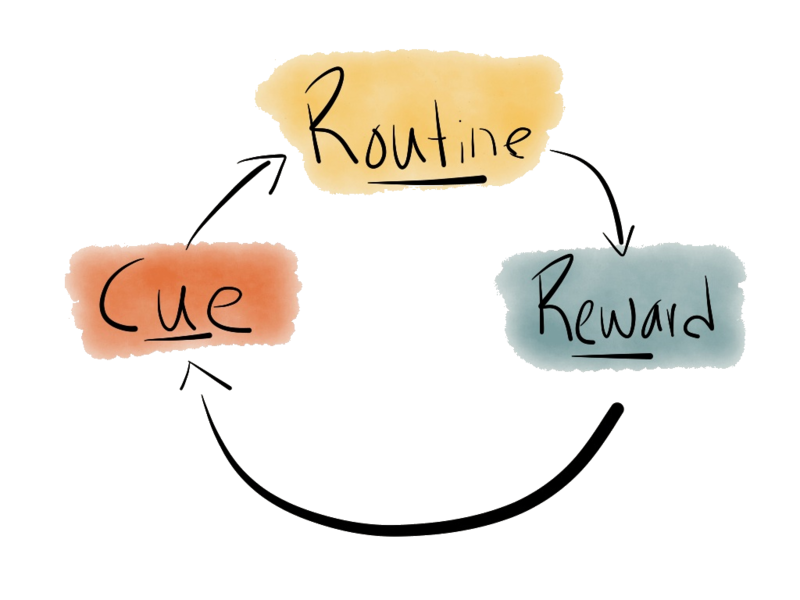 Finding rewards that seem to work will help you pinpoint the actual cue that is triggering the routine. Once you’ve discovered what makes you tick, it’s time to create a new routine that provides the same reward and works off of the same cue. You’ll find that most habits will fit into these three steps, even if the individual pieces are hard to identify. Understanding the process will help you replace undesirable behaviors with new, healthy behaviors. Your life could be described as the sum of your habits. The things you repeatedly do make up who you are. This could be the year that you become who you want to be. You just have to make those habits stick.